The White Mountain: Rediscovering Mount Washington's Hidden Culture, by Dan Szczesny, 2018. Travel writer and mountain enthusiast Dan Szczesny spends a year exploring the many facets of Mount Washington's history, mystique and culture, meeting many interesting characters along the way. 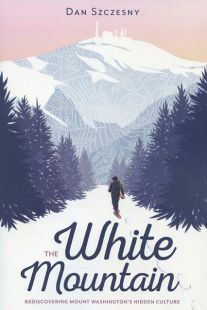 From accompanying a 97-year-old ultra runner, reading Walt Whitman while walking up the Auto Road in costume, introducing his young daughter to the Rock Pile, or spending a week cooking for the Observtory crew, the author weaves a fascinating narrative about New Hampshire's iconic mountain. Illustrated with color photo insert. 284 pp., 6" X 9."